Dimension X was an NBC radio program broadcast on an unsponsored, sustaining basis from April 8, 1950 to September 29, 1951. The first 13 episodes were broadcast live, and the remainder were pre-recorded. Fred Wiehe and Edward King were the directors, and Norman Rose was heard as both announcer and narrator (his famous opening: “Adventures in time and space… told in future tense…”). In Science Fiction Television (2004), M. Keith Booker wrote: “It was not until the 1950s that science fiction radio really hit its stride, even as science fiction was beginning to appear on television as well. Radio programs such as Mutual’s 2000 Plus and NBC’s Dimension X were anthology series that offered a variety of exciting tales of future technology, with a special focus on space exploration (including alien invasion), though both series also often reflected contemporary anxieties about the dangers of technology. 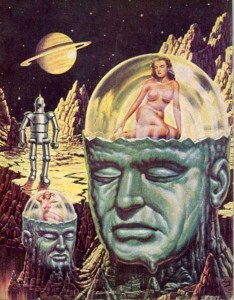 The series opened with “The Outer Limit”, Ernest Kinoy’s adaptation of Graham Doar’s short story from The Saturday Evening Post (December 24, 1949) about alien contact. A week later (April 15, 1950), the program presented Jack Williamson’s most famous story, “With Folded Hands”, first published in the July 1947 issue of Astounding Science Fiction. With a five-month hiatus from January 1951 to June 1951, the series spanned 17 months. All 50 episodes of the series survived and can be heard today. Later, NBC’s X Minus One (1955–58) utilized many of the same actors and scripts, and on a few occasions, reused the actual Dimension X broadcast with only minor editing.